Quilt Expo Madison and Quilts of Love Giveaway! 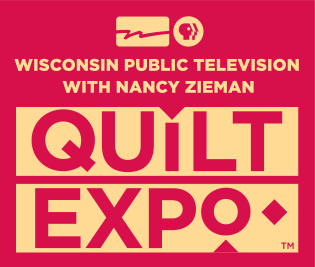 I’m heading to Madison tomorrow to Quilt Expo. Our assistant Stacy and later Bill will be vending with me in booth #534. I’ll be giving lectures every day at 11:30 so come by and say hi! Don’t be surprised if you see legendary Nancy Zieman and some cameras in the booth Thursday morning. Nancy’s dropping by to interview me for a Sewing with Nancy segment to air in 2015. I’ll be the one pinching myself that Nancy thinks I have something interesting to say. The publishers of a new quilt-themed romance series called Quilts of Love (great book covers, right?) have sent us three books to give away! It’s an interesting concept as each book is written by a different author and take place during different eras. You Michiganders will see that the one on top takes place at the Grand Hotel on Mackinac Island, where we’ll be teaching in 2016. We’ll mail them out when I return from Madison. Comment below if you’d like to win these three books and we’ll announce the winner next week. I’m afraid we’ll need to limit it to US addresses. You have until Monday September 8 to enter. Good Luck! So glad you’re coming back to Madison. See you soon! I love to read and would love to win the books! Have fun at Quilt Expo! I would love to read them! The books look really interesting. Mackinac Island holds a special spot in my heart. 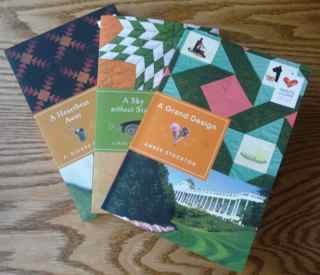 What fun to see these three books with quilts on the cover. I’m not sure if I would like the genre (more of a mystery and contemporary fiction reader) so they should go to someone who really loves to read romances. I wish I could be there in Madison to watch your interview. Good luck with the butterflies in your tummy – you’ll be GREAT!! I too love the cover design and do enjoy a book that incorporates quilts in the writing like the Aloha Quilt. Have fun with the interview,I look forward to seeing it. The books look like they will be a fun read. Thanks for the chance! The only thing I love as much as fabric is books, and books with quilting in them, alright! Thanks for the chance and enjoy the Expo! Have fun with your discussion with Nancy. To me she is a legion. I started sew in the 70’s with her. Heir product magazine was the only souce at the time whew I got the latest sewing supplies. Have a gray time at the expo. I would love to win the book, would you mind autographing it for me! Thank you so much. See you soon in Madison! How fun, love to read as well as sew! Thanks for the fun giveaway! I enjoy reading and a quilt theme will be fun. Oh, that’s exciting, always interested in quilty fiction! Love books with quilty themes. Sure would like to win these! looks like great books! Thanks for the opportunity! I wish there was a show like this near me! I love new books, thanks for sharing & hosting the giveaway! I’ll see you all on Saturday in Madison! I would love to read these. I am also interested in how different authors integrate quilts into the story. Awesome give away! Thanks! Have a great time in your travels! Saw you at Madison Expo today with our 2 boys-Thank you so much for the special attention and encouragement you give to them. Love love love your quilts!! I so enjoyed your lecture on Friday at Quilt Expo – and loving looking around and shopping in your beautiful booth there. Not to mention being able to pass around your fabulous quilts! Just when I thought I had read every quilty novel out there – here are some more! I would love to win. If there aren’t any holes, start with a layer of pebbles before adding the dirt. you can shred the tough stems in the garden shredder so they decompose quicker than normal.